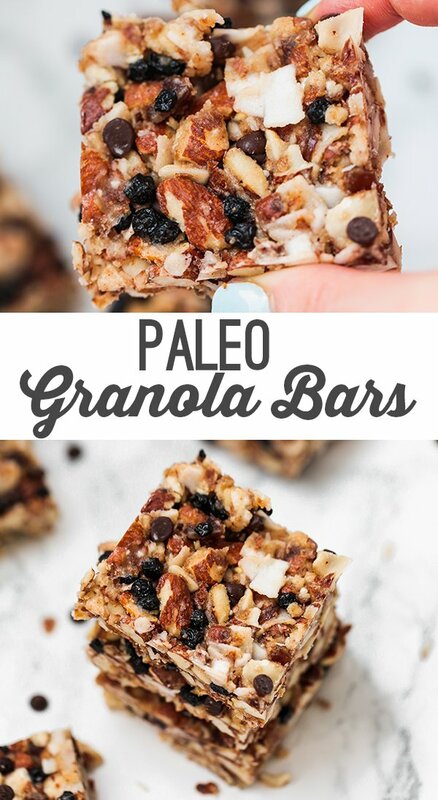 These paleo grain-free granola snack bars are an amazing snack on the go! They’re naturally sweetened and have healthy fats and protein. In college, I went through a period where I basically lived off of granola bars. I loved how convenient they were, how good they tasted, and of course… I unknowingly loved all of the sugar in them! 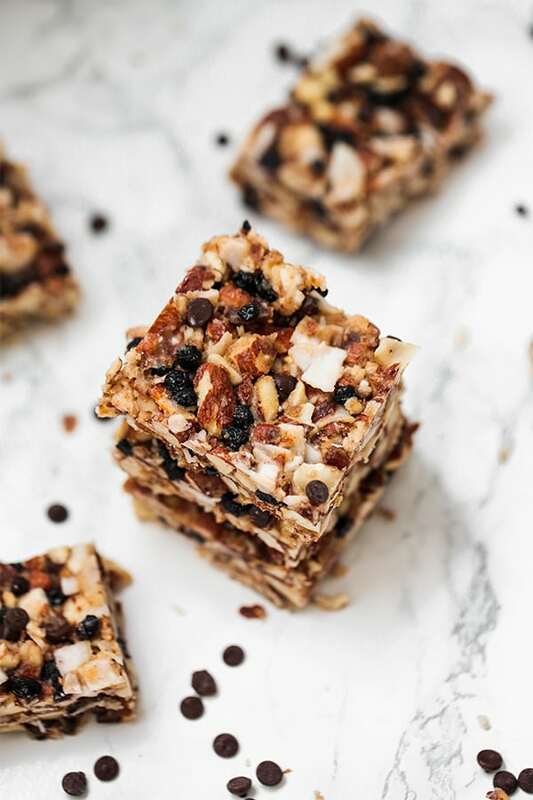 Granola bars are viewed as a healthy snack, but most bars you’d get in the store are really anything but healthy. They’re packed with processed grains, refined sugar, and little nutritional value. Sadly, most are basically just candy bars. Granola bars are one of the things I’ve really missed since going grain free. Grain-free granola can be hard to come by! 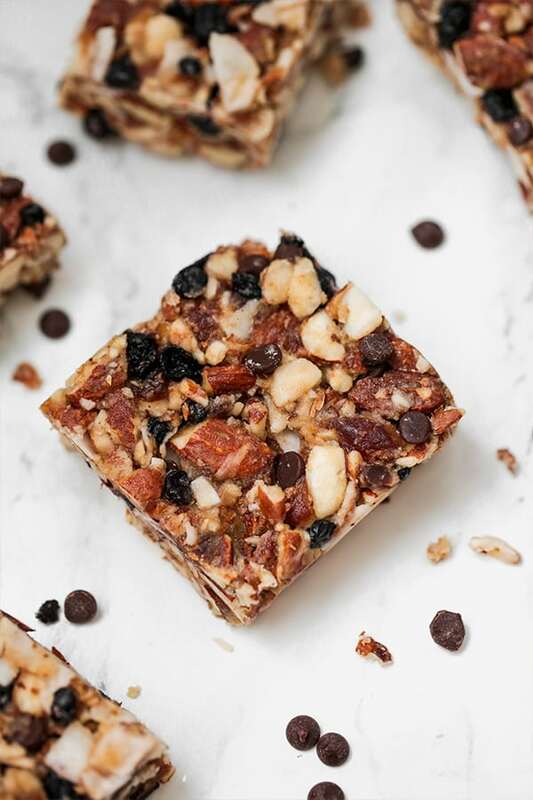 That’s why I made these delicious grain-free granola snack bars! They’re easy to make at home, fuss-free, and require zero baking. Heck yes! 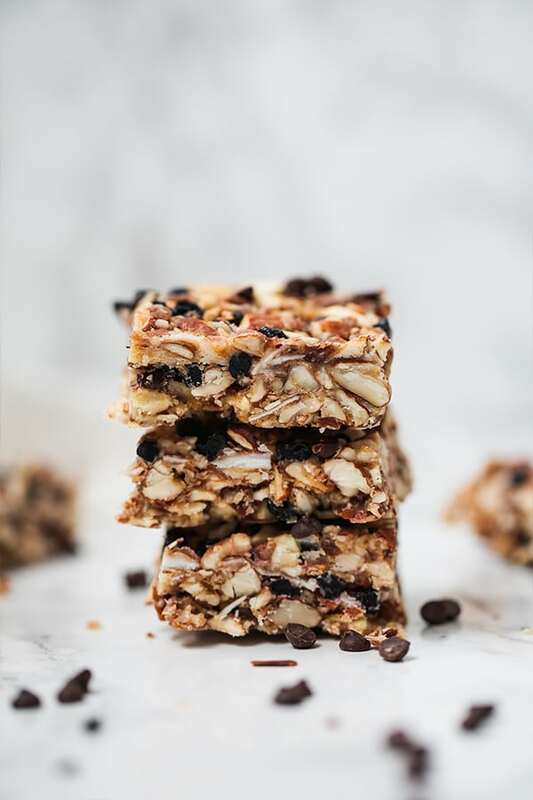 Almonds are the base ingredient in these bars. To make it nut-free, you can try using sliced tiger nuts. I find coconut chips to work better than shredded coconut in this recipe. These work as a binder in the bars as well as a source of healthy fat. These also are used as a binder in the bars and a natural sweetener. Use sugar-free dried blueberries like these and dairy free chocolate chips. You can omit the chocolate chips to keep it AIP. This collagen adds a protein boost to the bars! 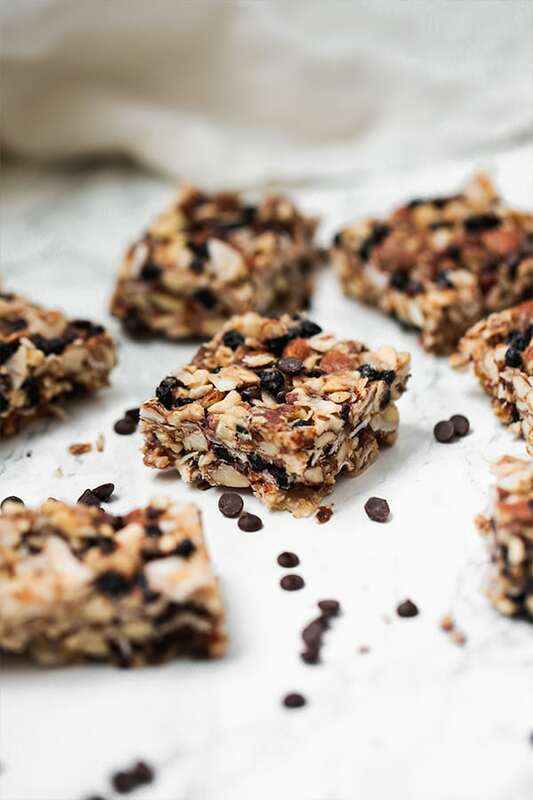 These grain free granola bars are the perfect gluten-free snack bar! Line an 8×8″ baking pan with parchment paper and set aside. If the dates are hard, soften in warm water for 10 minutes. Using a food processor, process the dates for 10-15 seconds. Add in the almonds and coconut chips and process for another 10 seconds. It’s fine to still have some big chunks here. Spoon the mixture out into a large mixing bowl, and stir in the remainder of the ingredients. Mix well to fully combine. Pour the granola bar mixture into the baking pan and flatten with your hands. Place in the fridge to fully harden for at least 3 hours. Remove from the fridge and allow to sit for 5 minutes before removing from the baking pan. Place on a cutting board and carefully slice with a knife into 9 bars. Serve chilled and enjoy as a snack! These bars need to be chilled to stay solidified. Keep them in the fridge or use an ice pack when traveling with them. All nutrition facts are estimations and will vary. You can try fresh, but it wouldn’t hold together quite as well as dried. These look amazing! Do you think I could sub raw honey for the maple syrup? You should be able to!! 🙂 Enjoy!